As the days before Christmas keep on getting smaller, we are currently knitting our fingers off! 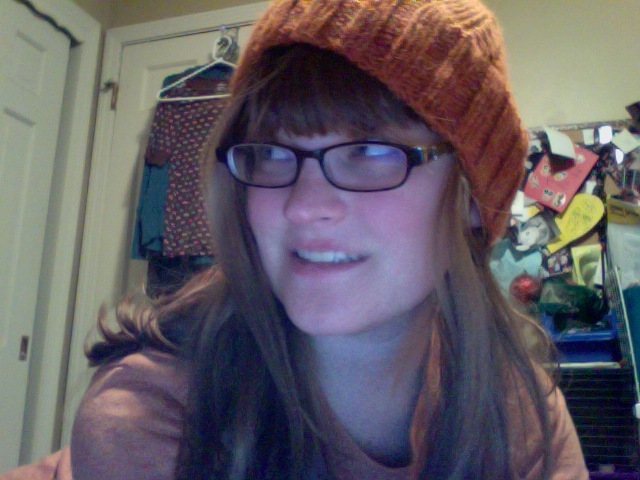 Brittany just finished two scarves (and they look so cool!) 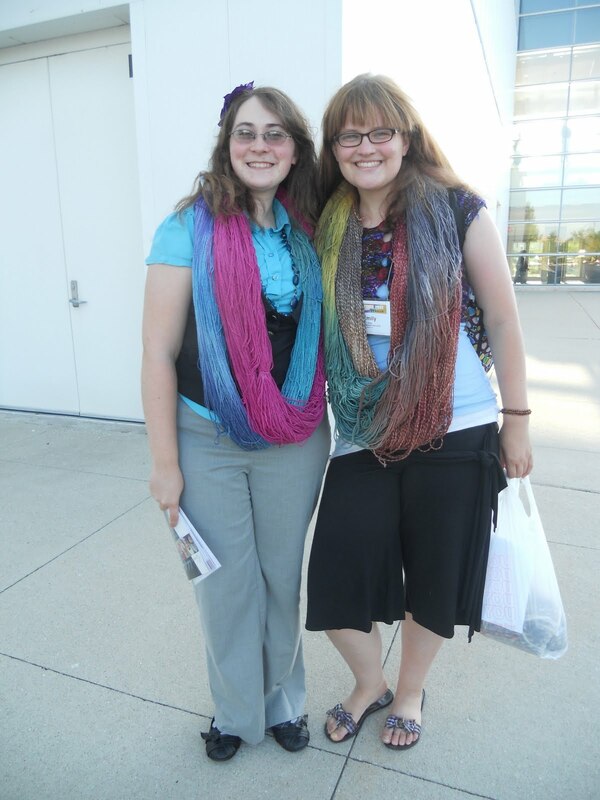 Stay tuned for her blog entries about these fab scarves! Our goal for us to knit 5 patterns before New Years is going along well. I am almost done with the Lion Scarf, I'm also making the twisted rib hat (for an Xmas Gift, so it will be finished by the 25th) and Brittany has one more project to make. We promise we are working very hard to achieve our goal! 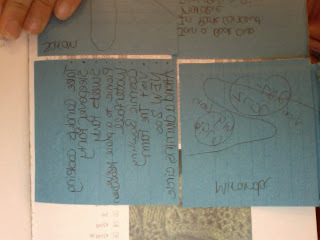 For now, we are trying to write about some of our projects that we finished before we started our blog. One of those projects is the Flip Top Mittens. I really did not care for this pattern. 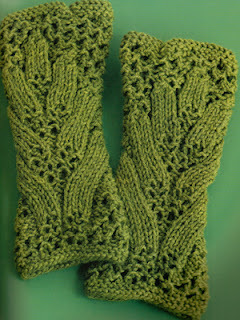 I have a different pattern that I use for flip-top mittens that I absolutely love! I have made that pattern quite a few times and I never had any issues with them. 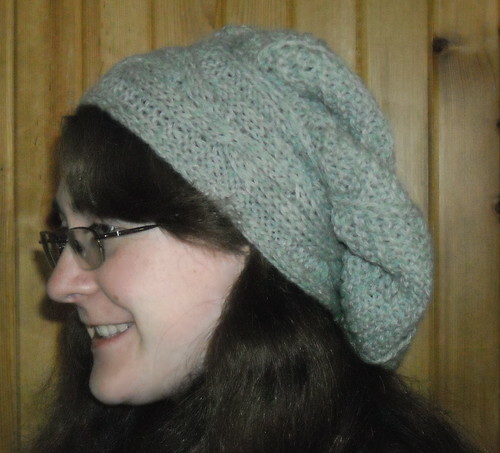 When I started this pattern, I was very shocked to see that the wrist pattern was not a normal rib pattern. 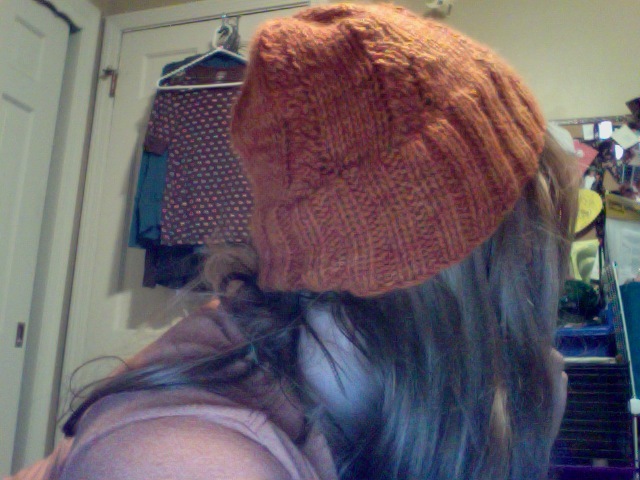 I was too much in love with ribbing to try this pattern. However, many people on Rav stated that this was their favorite part! So now I feel like I missed out on something special. The pattern is easy just some Yo's and ssk's. This pattern was just not for me. And that's okay. You might have better luck knitting with this pattern. I found the instructions to be unclear and unnatural for me. I suggest to still give them a try and let me know how they worked for you!!! The reviews on this pattern are mixed on Raverly. Many people changed the top of the mittens because they had a hard time working with the pattern. There are others that said they loved the pattern and it came easily to them. The biggest thing I found was making the top of the mittens. I felt that the part that covered the bottoms of the fingers was not enough space. 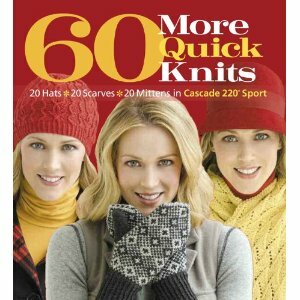 Plus this pattern doesn't have you knit down on the mitten, so the popup covers part of the actual mitten. Once the popup part hit the mitten it stopped. That causes fingers to pop out. In my mitten, I picked up stitches and ribbed down for about 2 inches and then added a button so Chelsea could seal the flap shut. The seal would then not have any holes, unlike the original pattern. This way part of the mitten and the popup part overlap, which lacked in the original pattern. 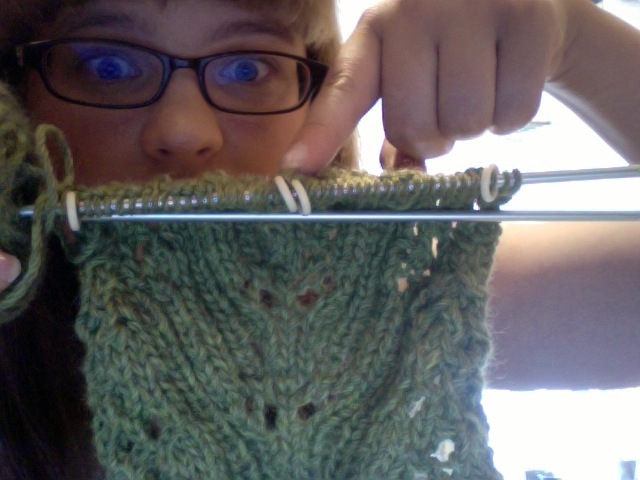 Since I didn't knit down enough...I still had one hole. Chelsea had a pinkie that wouldn't stay in the mitten. 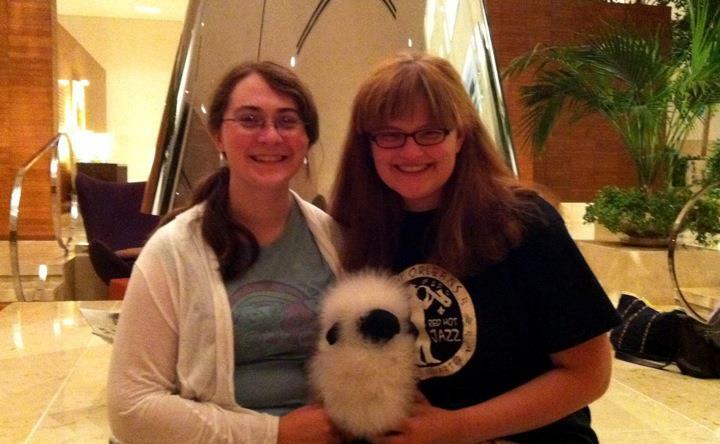 You can see in this picture that some of the flap that is supposed to cover up the mitten is sticking up. Therefore, I had to have Chelsea wear the mittens and seal the hole shut. It worked out very well. 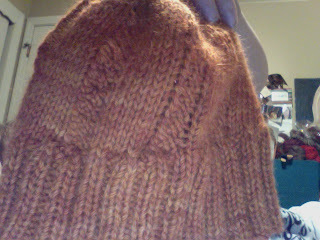 Next time, I would make the ribbing part 3 inches instead of just two! 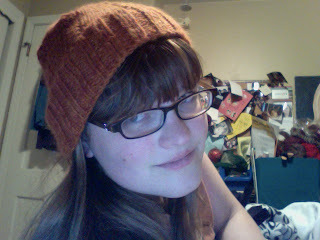 Nevertheless, I was able to make them work for my dear old pal Chelsea. She loved the mittens! She said they were very warm! 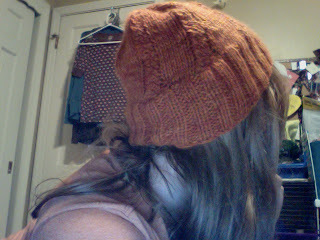 For those who are curious, I used Nashua Granite Yarn. (Sorry Cascade, she wanted grey and this was in my stash!) 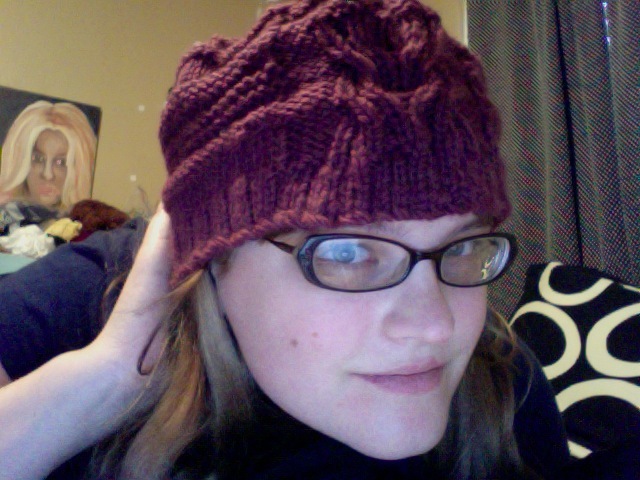 The yarn worked up beautifully! I wanted to talk about the Cables & Wraps Scarf today! So why has it taken me this long to write about this pattern? Well, the reason is very simple. 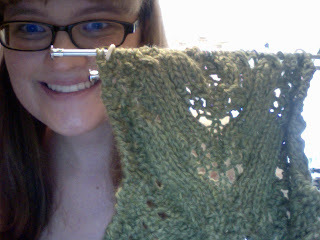 I have started and frogged this scarf quite a few times. 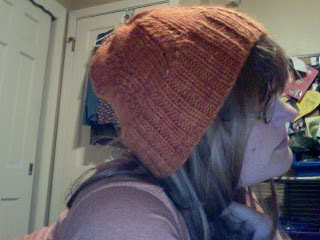 First my yarn was too thin. I used a sport weight yarn and it was taking FOREVER. 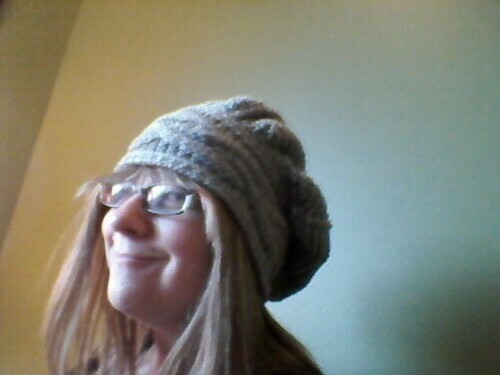 So I changed the yarn. Second time was my own darn fault. I didn't store my knitting in a good place and the project kept falling off the needle. The third time I made the scarf, I found this particular pattern to be difficult. I worked on this scarf while I was on my housekeeping job, therefore I got distracted too easily. Plus, all of the rows are extremely similar, so I would start reading one row and then move to the next row. 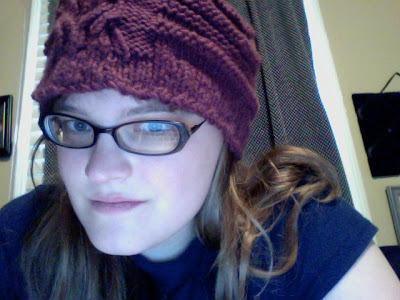 So, now a year later, I frogged it AGAIN and used the proper worsted weight Cascade 220 yarn. 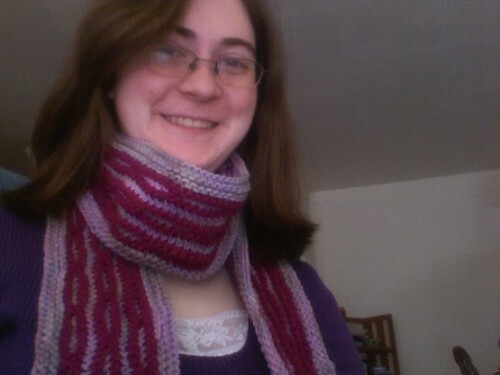 I have been able to knit this scarf more than 2 inches ever since! I purposely used a lighter color so everybody can see the complicated pattern. I feel if I am going to take this much time working on this pattern, then I must make sure that everybody can see it. I found a misfit skein of Cascade 220 Heathers sitting at my local yarn shop and decided it needed to be made into this awesome scarf. As for errors... there seems to be one that I have found. 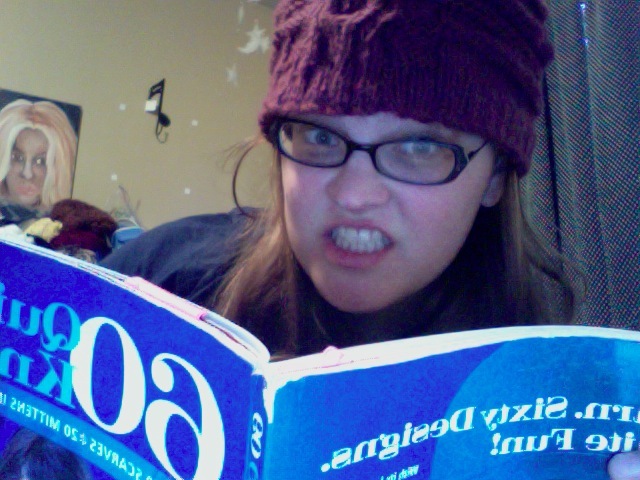 This might not make complete sense unless you have the book in front of you. Bear with me please! 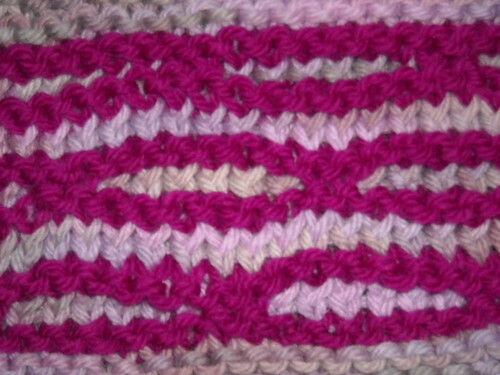 On Row 3 you are increasing stitches to make the ovals. These ovals are a total of 7 stitches. In order to increase these stitches, you are supposed to knit into the next stitch. On Row 3 you currently have 5 stitches in the oval part of the scarf. You K2, K into the next stitch, K2. Row 4 has you knitting all 7 of those oval stitches... but according to my math teacher, the calculator, and my own pen and paper: 2+2+2=6 not 7. This means that we need to increase an extra stitch within the five original stitches. This scarf is a lot of fun to make. 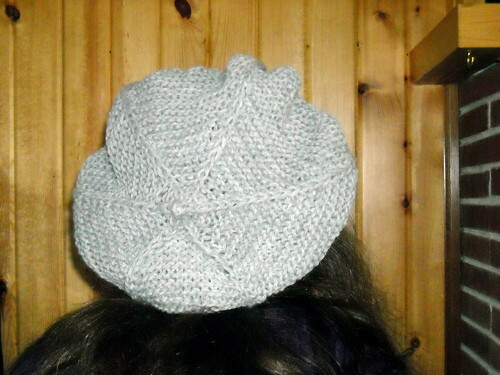 The pattern really isn't that complicated once you have done enough repeats. 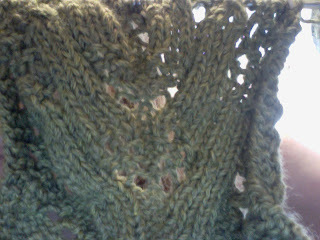 This scarf does take a while to finish, but it is worth the time put into it! I cannot wait to see mine finished!!! 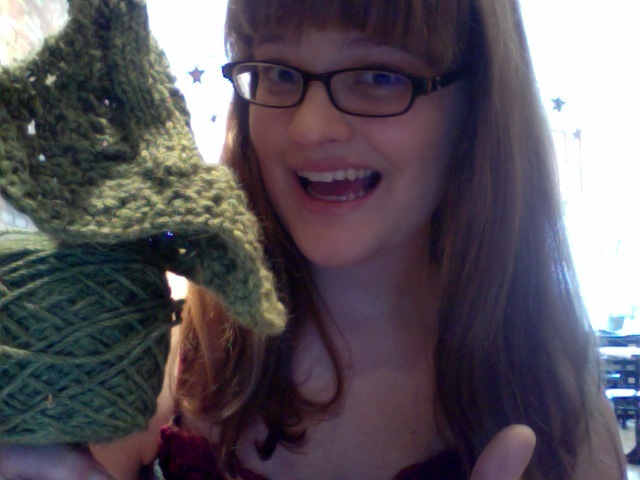 Hopefully I will overcome all the issues I'm having with finding the second ball of yarn to go with it! 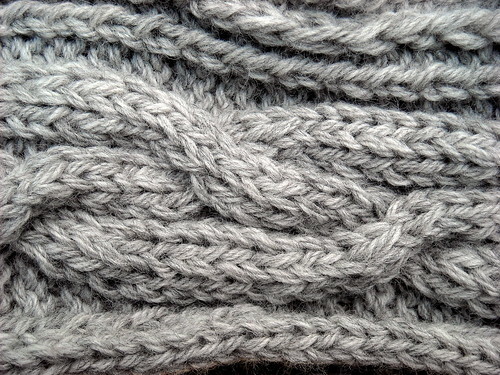 Pattern #12 Cables & Wraps Scarf - In Progress Update Coming Soon! Hi everyone! It is Brittany. 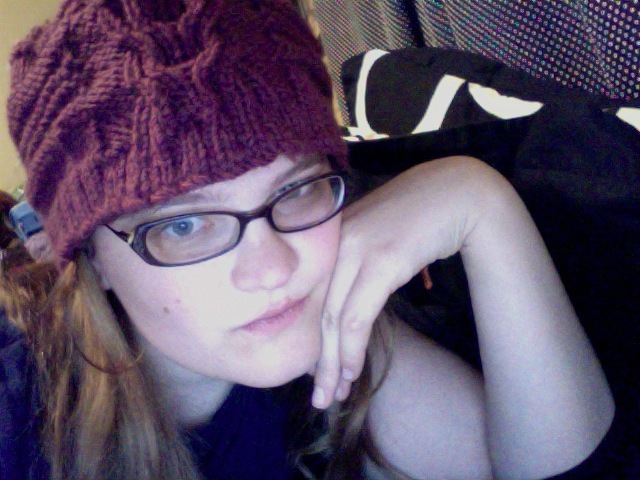 I have actually finished 2 projects from 60 Quick Knits yesterday. I also almost finished a whole extra project today! However, I am not going to talk about those projects just yet. Instead, I'm wanted to tell you about the great yarn shop Em and I visited today. Em and I drove about 40 minutes from my apartment this morning to get some amazing Cascade yarns. Our friend Zoe had told us about this yarn shop that had a variety of Cascade yarns. Em and I had talked about going there for a while, but we never did. 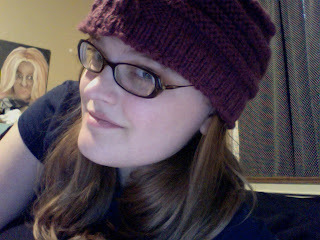 When a Ravelry knit-a-long for the Cabled Ski Cap (60 More Quick Knits) came along I needed some Cascade Sports Weight. The Copper Llama seemed the perfect place to go. The Copper Llama is a beautiful yarn shop with a wide variety of Cascade 220 yarn. They do not exclusively sell Cascade, but they had brands of Cascade neither Em or myself had ever heard of. Not only was it great to see all the colors and kinds, but the yarn shop itself was so unique. It is attached a little farm where you can see llamas. The yarn shop has a log cabin feeling and the owner was wonderful. 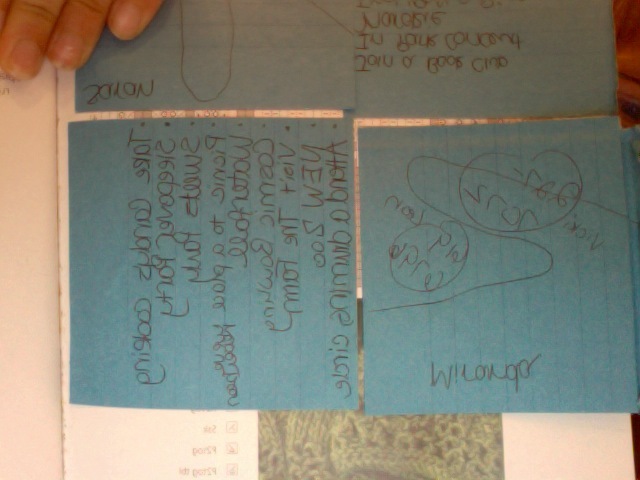 She offered us tea almost the second we got there and she even put up with us talking about teaching.